"Aw, just lookit that face! Who's a cute widdle boopsie woopsie baby? Is it you? Yes, it's you!!" It's all fun and games 'til you cut the cake. Yes, I have an example. Brace yourself. No really, look at it. Aren't you glad the eyes aren't open? I would insert some side-splitting commentary here about how stabbing someone in the back always gets you the cold shoulder in the end - but as you can see, there's no need. He's already "waist"ing away! Hey, Benji! You just got served! Ah, I crack myself up sometimes. Anyway, we still haven't gotten to the worst part yet. The worst part actually, literally, in real reality, honestly gave John nightmares. Seriously. So now he won't let me post it here. Instead, I'm going to link to it. But please, all joking aside, choose your clicks wisely. I'm here to make you laugh, not give you nightmares - and this thing puts the "ick" in "squicky." Ok, enough warnings (since I'm sure they're having the opposite affect anyway): Click here to see the final photo. 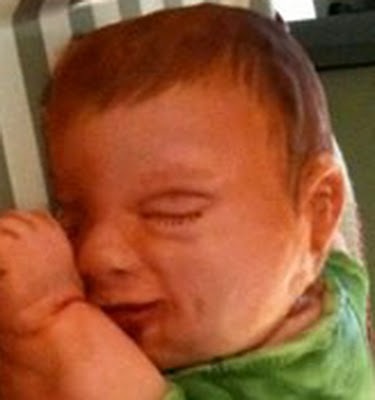 Thanks to Kimberley K., who will never again say to a child, "I could just eat you up!" Note from John: I initially made that last picture a separate post and linked to it, not realizing it would show up in Google readers before the actual post. Oops. Sorry to those of you who clicked on it with no warning! Oh and if the new link doesn't work, you may have to refresh the page. DEAR FSM!!! That's just not right. Although the "stuff of nightmare" picture makes more sense (that hit my blog reader first for some reason). I had NO idea what I was looking at. That last photo came up first in my reader feed. Yeah, definitely nightmare fodder, with no warning. 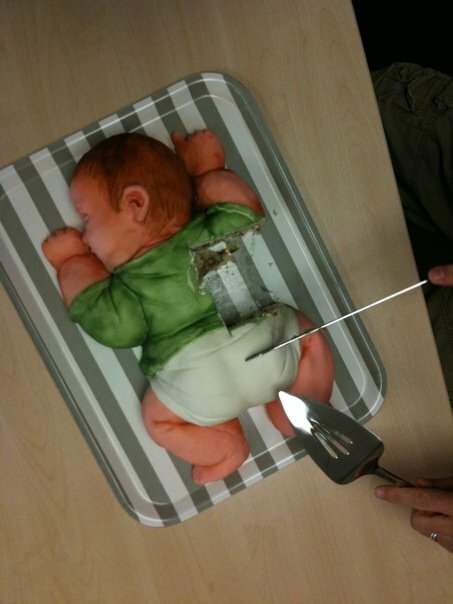 I wondered how people dealt with the actual cutting of the scary baby cakes. Don't think I could do it myself. I'm glad it's not a red velvet cake..
Who does something like this? Don't people think this through?? Eyagh! ahhh! I don't get how people want to cut into babies. SOOO creepy. Holy wow! That is really creepy....Yeah...I think I'd have been gagging at that shower. If that last photo doesn't convince bakers that realistic baby cakes (maybe baby cakes in general) are just WRONG, I don't know what will. I think I like my cake in abstract, geometric shapes. Saw the last picture first and couldn't for the life of me figure out what it was...not sure if I'm better off knowing. Good thing it's a chocolate cake and not a strawberry cake...maybe. No couldn't do it. I have trouble cutting into a picture of a person on a cake. This creeped me out so much, I will not be able to eat breakfast. Seriously. WTF? I don't leave too many comments here, but this is just awful! That goes on to my hated list of thing you can't un-see. Seriously disturbing. Whoever ordered that cake needs a serious smackdown! There is NOTHING right about that! That last pic actually made me jump. Urg, no WAY would I ever make something like that, no matter what the customer was willing to pay. That's just wrong on soooo many levels. "Baby, the other other white meat." 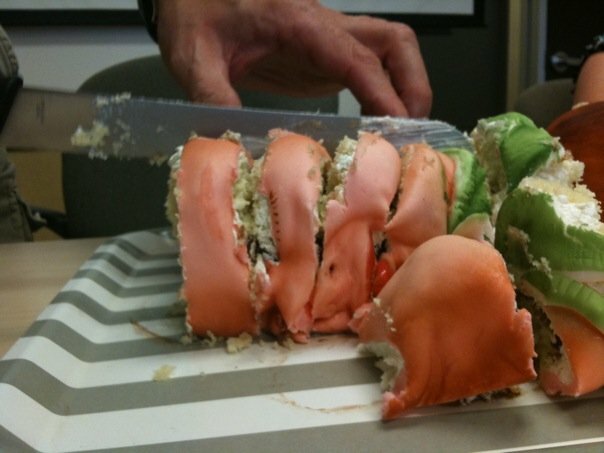 I thought it was a cake of sushi. A California roll. Yep, definitely a rainbow roll. See, the pink is salmon, and the green is avocado. I usually just lurk here, but...Egad! Cakes that resemble real people or animals are cute/cool, but I don't think I could eat them. Same with pinatas offered in birthday/holiday catelogs. If they are shaped like animals or have pictures of characters, bands or tv personalities, why would you want to smack it with a stick??? Why, why, WHY did I let myself click on the link?? My eyes! They burn! My stomach! It heaves! The HORROR! It's like the Bride of Chucky had an affair with a Cabbage Patch Kid and got herself knocked up. With THAT being their offspring. That's the most disturbing thing I've seen in ages. That poor mother. I hope she recovered from her shower before she had her baby. That it is on a LUNCH TRAY just makes it so much worse! WV: Potbo - When you want to give the gift of medicinal herb to someone on their birthday, you put a big potbo on top. The picture in the LINK seriously made me want to cry. I was thinking what Kira Zobel already wrote - SO glad it's not red velvet!!! I'm going to echo the "at least it's not red velvet cake with raspberry filling" sentiment. Creeptastic indeed. You were so right! That was at once hilarious and disturbing. That's somehow wrong, no matter how you SLICE it! That last photo is a CUT about the rest? OOoooh, the bad puns keep coming! I'll try to stop! why'd they start at the side? So they could watch the expressions? May 24, 2010 | Jimh. 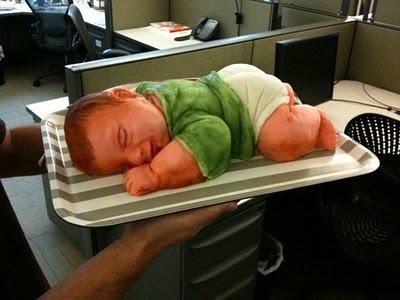 When I saw the chopped up baby face last night with no explanation or warning, I thought it was sushi. i saw the last photo first, and i won't lie to you... it was highly disturbing. i actually thought that maybe i was looking at a sliced up whole roast pig cake or something. *shivers* yuck. I have never seen anything more disgusting or ill-advised. I'd love to know who really thought that was a good idea. Give me carrot jockeys any day! Hahahahaha! That is so nasty! YOU HAD TO POST THIS THE DAY AFTER MY SISTER GIVES BIRTH TO HER FOURTH BABY?!?! I'm so thankful it was NOT a red velvet cake....I was bracing myself for that! :( Sickos. 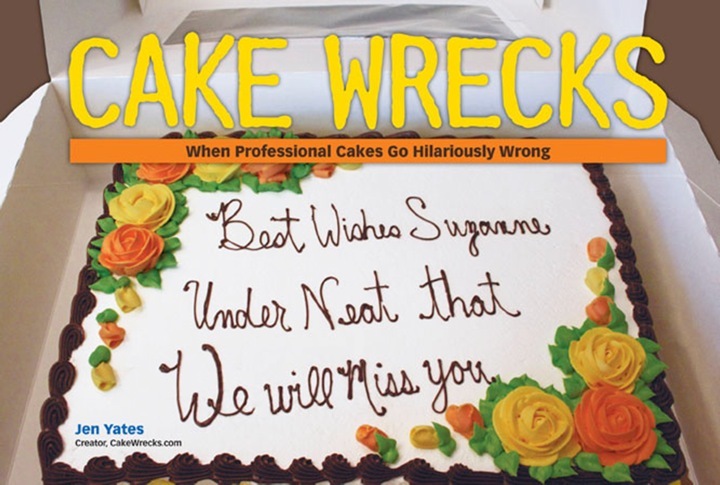 This idea for a cake makes no sense; it's just nasty! Okay. I guess I'm a sicko or something, cause that last photo made me laugh. Not with glee, but at the ridiculousness of it. Oh thats sick, WTF were they thinking?? i must be demented. That photo didn't freak me out. I looked at it and thought "It looks like a Dali painting"
Please, may we all LEARN from this. I can barely stand to cut up one of those cakes with an enlarged photo on it. Baby, the OTHER white meat? The link won't work for me... :( can you post a new link? I think I'm going to throw up. And that will look better and be more appetizing than that wretched cake. Peptide cake, with mint frosting? Oh the HORROR! That last cake was Japanese horror movie scary! Aw, geez...that's just not right. Not right. "If they are shaped like animals or have pictures of characters, bands or tv personalities, why would you want to smack it with a stick???" I think that depends entirely on the character. YEAH, PIKACHU! I'M LOOKIN' AT *YOU*!! Going back to sleep now w/ the relaxation DVD turned to HIGH. My condolences & understanding to John. Wv: BULAB: an organization one of you could start: Bakers United Lobbying Against "Babies"
May 24, 2010 | Laura W.